Patients with chronic obstructive pulmonary disease (COPD) often need daily maintenance medicines that reduce airway swelling, relax the muscles in the airways and help the lungs work better. Spiriva, a long-acting, anticholinergic bronchodilator is a maintenance medication that can help you manage your COPD symptoms. First approved by the FDA as safe and effective for daily use in 2004, Spiriva is a brand name formulation of tiotropium bromide. The medication comes in two different formulations—Spiriva Handihaler, a powder, and Spiriva Respimat, a spray. Both are delivered via oral inhalation as a once-daily maintenance treatment. 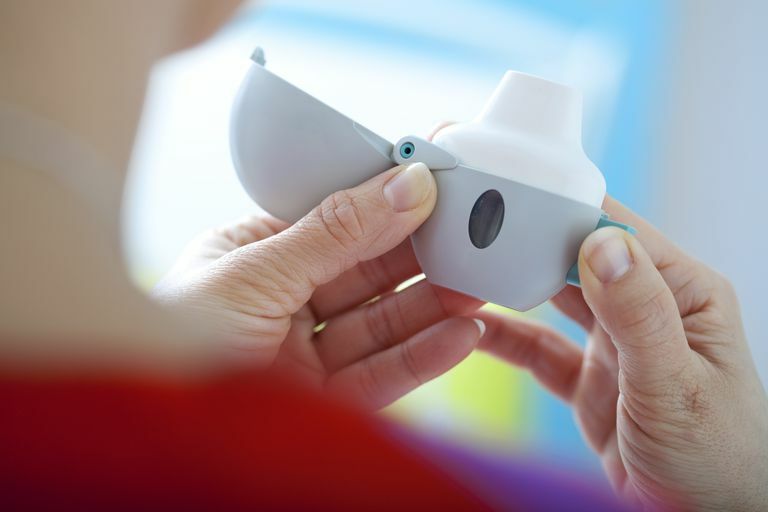 The standard dose for patients with COPD is 2.5 mcg, although a lower dose is available and approved for use in controlling asthma. There are numerous possible side effects of using Spiriva that you should be aware of ranging from common to more severe. Side effects for both Spiriva Handihaler and Spiriva Respimat are generally similar, although some patients who have unpleasant side effects with one formulation experience less difficulty with the other. Contrary to earlier studies, Spiriva does not increase the risk of stroke or other cardiovascular events. The following is a list of possible drug interactions and side effects, although additional unreported problems may be associated with use. Be sure to talk with your healthcare provider if you take these, or any other medications, before taking Spiriva, or if you experience additional side effects that are not mentioned here. This is only a partial list of possible drug interactions. Be sure to talk with your healthcare provider if you take these, or any other medications, before taking Spiriva. To do this, you'll need a prescription for Spiriva from your doctor, a Spiriva HandiHaler, and Spiriva capsules containing the medication. Open the gray dust cap of the Spiriva HandiHaler device. Open the white top of the Spiriva HandiHaler mouthpiece. That should reveal the tiny slot where the capsule (also known as the capsule reservoir) will be inserted. Remove the capsule from the Spiriva capsule package. IMPORTANT: THE SPIRIVA CAPSULE SHOULD NEVER BE SWALLOWED! Place the capsule into the Spiriva capsule reservoir. Close the white mouthpiece cover on the Spiriva HandiHaler device. Push the button on the side of the HandiHaler. This punctures the Spiriva capsule and allows the medication to be released and subsequently inhaled. Place the Spiriva HandiHaler to your mouth and tightly seal your lips around the mouthpiece. Breathe in quickly and deeply through the Spiriva HandiHaler. You should hear a rattling sound as you take a deep breath. This indicates the medication is being dispensed correctly from the capsule. If you don’t hear a rattling sound, try the following tips: Check to make sure the mouthpiece on your Spiriva Handihaler is tightly closed. Hold your HandiHaler upright and tap it gently on a tabletop, counter or another hard surface. Try inhaling again. If you still don’t hear or feel the capsule rattle, talk to your doctor or pharmacist as soon as possible. If possible, hold your breath for five to ten seconds, then breathe out normally. Rinse your mouth with water or brush your teeth after each use. Open the white mouthpiece cover and remove the capsule from the capsule reservoir. Close the white mouthpiece cover and gray dust cap of the Spiriva HandiHaler. Throw the capsule away in the trash. Clean your Spiriva Handihaler once a month per the manufacturer's instruction. Never use anyone else's Spiriva HandiHaler or share your device with anyone. Keep this and all other medication away from children. Do not use more than the recommended dose of Spiriva. Using more medication than your doctor prescribed won't help your COPD treatment, and may cause side effects. Do not store used or unused capsules inside the Spiriva HandiHaler. Do not remove a capsule from the package until it is ready to be used, since doing so may reduce its effectiveness. Avoid getting the powder from the Spiriva capsule into your eyes. Can the COPD Medication Spiriva Increase Your Risk of Stroke?